Let us imagine this situation which is rather common these days. You are at the end of your working hours but there’s still work left. You can’t do it at work tomorrow – maybe the deadline is approaching fast, maybe tomorrow’s weekend. Today’s trends allow people to take their work home and work on their laptops, tablets and smartphones. While smartphones aren’t the ideal means of work, the best choice is left for laptops and tablets. The question is: what to choose? Here we will present why the tablets are the better option when it comes to work. 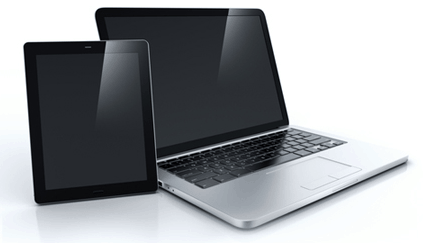 It is no secret that tablets are considerably smaller, thinner and lighter than laptops without a considerable reduction in their functionality. Have in mind that one pound of weight makes a lot of difference when having to take the bag around. The added functionality of having tablets is that you can take your tablet in whatever bag you ordinarily use, whereas laptops generally require their own bags which leave little room for anything else. Now, for long projects, laptops are a better option in the context of not having a virtual keyboard that takes more than half of the screen when it comes to the tablets. However, tablets win over laptops when it comes to sheer competitiveness of app creators. Apps are updated more often, whereas laptop programs may require a year or more to be improved. The lightness of tablets has one additional aspect that is often neglected. Laptops are generally impossible to use in a taxi or during a plane ride, and completely useless while walking. All laptops require a flat surface (if you want to keep it healthy and off your knees). Tablets can practically be used anytime and anywhere – they’re just that practical. Battery life is the bane of laptops. While they’re constantly being improved in the battery department, most wouldn’t last one single work day. They have to be charged constantly, and good deal of laptop users strive never to remove them from their chargers – and for a good reason, too. When it comes to their general performance, tablets are comfortably situated between smartphones and laptops. Having that in mind, tablets do have certain functions that outshine laptops by far when it comes to actual work. Laptops can’t take photos or videos (without the additional hardware, of course); they can’t make conference calls or utilize video chatting. The e-reader function of the tablet is also an amazing feature, allowing you to bring entire libraries with you in one go. Of course, tablets aren’t perfect; they are amazing for many business tasks, suitable for most. For others, you might be off better with laptop or smartphone. But in general, tablets outshine the both devices with their size, performance, functionality and overall usefulness. For most of us who work, that is all we could have ever asked for in a device.